The first days of spring brought additional snowfall to the entire northern East Coast area, impacting people in New York, New Jersey, and throughout New England. With accumulations of 36 inches or more in some locations, recovering after these events can prove challenging. Your home is one of your most important investments, and to protect your assets in terms of damage and potential liability, there are some specific steps you will want to take as part of your clean up efforts. Accuweather reports that snow, rain, and icy conditions could continue to be a problem in our area on through the end of March and into April. As one winter storm after another has battered the east coast, invest some time in inspecting your property and making any needed repairs. Lingering damage that goes undetected can damage your home and diminish its value, in addition to putting the safety of your family and others at risk. Regardless of any lingering snow accumulation, you need to check your roof for signs of damages or debris. While you are up there, check your gutters for ice dams and rake out any leaves that may be blocking water from draining. With nowhere else to go, accumulated water will eventually find its way into your home. In addition to clearing away ice and snow, check paths and walkways around your house for structural damages. Uneven or broken paving stones present a significant slip and fall hazard. If you are unable to make repairs immediately, put up some orange cones to warn the mail carrier or others who may approach your home. Check for loose tree branches. In addition to preventing slips and falls, you want to make sure no one on your property can be injured by falling tree branches. 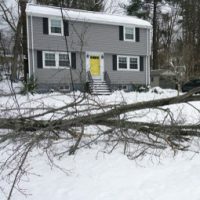 As the result of heavy snow, ice, and an accumulation of water at the root, trees will be susceptible to damaged limbs and unstable root systems. Along with the potential liability this could create for you as a homeowner if someone is injured, falling tree branches can do significant damage to your porch and other structures. Odds are, your heater has been putting in some heavy duty over the last few months. Check your system and your home vents for blockages and replace filters. Deaths and illnesses due to carbon monoxide poisoning traditionally skyrocket over the winter. While you are at it, check gas lines and electrical wiring as well as for any damages that may have occurred. Call in a professional to do an inspection if you have any doubts. To find out additional ways you can protect your assets and avoid potential liability, reach out and contact Cavallo & Cavallo today. We can arrange a consultation in our Bronx or New Rochelle office to discuss your situations and address any of your concerns.